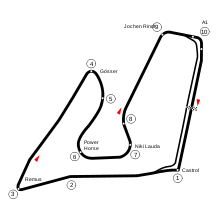 The 2002 Austrian Grand Prix (formally known as Grosser A1 Preis von Österreich) was a Formula One motor race held on 12 May 2002 at the A1-Ring. It was the sixth round of the 2002 Formula One season. This race saw a staged finish, in which race leader Rubens Barrichello was ordered to allow Ferrari teammate Michael Schumacher to overtake him and win the Grand Prix. Ferrari wanted their number one driver Schumacher to win the race and collect the maximum points for the Drivers' Championship. Barrichello let him pass on the last lap at the finish line which greatly upset the spectators. Barrichello had also yielded second place to Schumacher at the line in the previous year's event. 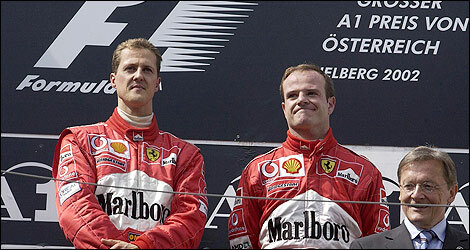 Barrichello subsequently revealed that Ferrari had threatened to end his racing career unless he yielded the place to Schumacher. Fifteen years later, in 2017, Ross Brawn admitted that the entire incident had been a big mistake. On the podium, in response to the jeers of the crowd, Schumacher insisted that Barrichello take the top spot on the podium. Schumacher took the trophy for first place from the Austrian chancellor and gave it to Barrichello, who then took the second-place trophy. Barrichello, Schumacher and Ferrari were fined one million U.S. dollars for the failure to observe Article 170 of the Formula One Sporting Regulations concerning the podium ceremony. As a result of this, and another incident at the United States Grand Prix, the FIA declared new rules against team orders which would artificially affect race results. The race also featured a huge accident between Takuma Sato and Nick Heidfeld. Heidfeld lost control over his car due to a rear suspension failure on the way into a corner, causing it to spin across the infield and back across the circuit, spinning backwards into the side of Sato's car. Sato suffered minor injuries but got stuck in the wreckage and it took several minutes for the track marshals to cut him out from the vehicle, Juan Pablo Montoya (who just barely avoided being hit himself) said that Heidfeld was travelling so fast that he could not tell if he was going backwards or forwards. Rubens Barrichello grabbed his second pole position of the season by beating last year's pole time by 1.5 seconds, and beating his team-mate Michael Schumacher by over 0.6 seconds. Ralf Schumacher split the two Ferraris and Juan Pablo Montoya qualified 4th despite having to use the spare car. Nick Heidfeld in the improved Sauber managed to qualify in 5th ahead of Kimi Räikkönen in the McLaren. Felipe Massa took 7th ahead of David Coulthard. Olivier Panis and Mika Salo completed the top 10. Michael Schumacher, Heinz Harald Frentzen and Jacques Villeneuve and Alex Yoong set times slower than their best times from the morning practice. The first three were Bridgestone runners, possibly indicating a degraded performance under warmer conditions. Fourth to eighteen positions were covered by a gap of only 0.94 seconds. Ralf Schumacher, Nick Heidfeld, Felipe Massa, Olivier Panis, Enrique Bernoldi and Allan McNish had their best qualifying positions so far in the season. Rubens Barrichello and Mika Salo equalled their best positions. While Michael Schumacher, Kimi Räikkönen, David Coulthard, Jenson Button, Jarno Trulli and Jacques Villeneuve had their worst qualifying positions so far in the season. Giancarlo Fisichella, Mark Webber and Alex Yoong equalled their worst positions. Jacques Villeneuve received a drive-through penalty for causing an accident while Mark Webber received the same penalty for ignoring blue flags. ^ "2002 Austrian Grand Prix podium". Retrieved 2016-07-26. ^ "Barrichello Admits Team Orders". www.gpupdate.net. 2008-11-25. Archived from the original on 2012-03-21. Retrieved 2011-01-28. ^ "Barrichello reveals Ferrari 'threat' of 2002". motorsport.com. Retrieved 30 September 2018. ^ "Brawn: Staged finish in Austria 2002 a big mistake for Ferrari". f1i.com. 6 February 2017. Retrieved 30 September 2018. ^ "Official FIA Press Release – The 2002 Austrian Grand Prix". www.fia.com. 2002-06-26. Archived from the original on 17 October 2006. Retrieved 2006-10-26. ^ "2002 Austrian Grand Prix – Qualifying Session Report". NewsOnF1. Retrieved 23 February 2016. ^ "2002 Austrian Grand Prix – Qualifying Session Results". NewsOnF1. Retrieved 23 February 2016. ^ a b "Grand Prix of Austria". FIA.com. Fédération Internationale de l'Automobile. Archived from the original on 18 October 2012. Retrieved 26 December 2015. ^ "Grosser A1 Preis von Osterreich – 2002". Formula 1 Database. Archived from the original on 10 December 2008. Retrieved 23 February 2016. ^ "2002 Austrian Grand Prix – Race Results". NewsOnF1. Retrieved 23 February 2016. ^ "2002 Austrian Grand Prix". Formula1.com. Formula1.com Limited. Archived from the original on 13 October 2014. Retrieved 26 December 2015. ^ "2002 Austrian GP – Penalties". ChicaneF1. Retrieved 23 February 2016. ^ a b "Austria 2002 - Championship • STATS F1". www.statsf1.com. Retrieved 8 March 2019. Wikimedia Commons has media related to 2002 Austrian Grand Prix. This page was last edited on 30 March 2019, at 01:40 (UTC).